After just five years on the Market, the 9th generation Honda Civic was replaced with a new model. The Honda Civic hatchback focuses on combining the best of all worlds – big on comfort, packed with tech, and offering a turn of speed and performance for those who like to enjoy their thrills without going for a full-fat Civic Type R – though there’s a new one of those too. 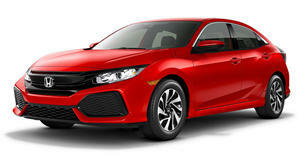 Based on Honda’s compact global platform and featuring an all-turbo engine line-up, the Civic hatchback rivals the VW Golf, taking it closer to the premium segment and further away from rivals like the Ford Focus. With a sleeker design, the sloped rear roofline impedes rear entry only slightly – requiring you to watch your head. But the door apertures are large and open wide, making it easy to climb in or install a child seat. The driver’s seat adjusts to find a comfortable driving position, and the seats themselves are incredibly comfortable even for longer journeys. The Civic hatchback has been packaged in such a manner that even six foot tall occupants can sit behind a driver of a similar height and still have ample leg and head room – even with the optional sun roof. With the rear seats in place, the trunk of the Civic hatch packs 25.7 cubic feet, but fold the second row in a 60/40 split and that volume swells to 46.2 cubes. The cabin is also packed with tech, including a new high resolution touch screen with Android Auto and Apple CarPlay. Electronic power assisted steering takes a toll on the feedback received from the steering wheel – but the weighting is sublime, and responses linear and pin-point accurate. By current standards, this is about as good as it gets. Standard models ride on 16- and 17-inch alloys, but 18s are available on Sport models. Even on larger wheels, the ride is supple and soaks up bumps impressively. You feel everything through the chassis, but not obtrusively so and mid-corner bumps do little to upset the ride. That it maintains connection with the road at all times without feeling floaty at all is nothing short of phenomenal. Of course as a front-wheel drive car, one would expect that its limits would be quickly reached, but alas it’s not to be! Front end grip defies sanity at this level – offering the same sort of grip you’d find in bona fide hot hatches, despite the commuter comfort. Since Honda took the leap into turbocharging, they’ve gone headlong into it. The Civic hatchback now features one single turbocharged 1.5-liter 4 cylinder across the range. There are two outputs available, the base output of 174 horsepower on all models except the Sport and Sport Touring trims which receive 180hp. All models are front-wheel driven with all but two trims – LX and Sport – featuring a continuously variable transmission as standard. With a manual gearbox, the LX trim gets 167 lb-ft of torque, with the Sport getting an additional 10 – but all models with a CVT get 162 lb-ft regardless of power output. The Civic hatchback can be equipped in 5 trim levels – LX, Sport, EX, EX-L Navi, and Sport Touring. All models feature at least single-zone automatic climate control, with EX, EX-L, and Sport Touring models getting dual-zone. Even as the base spec model, the LX comes well equipped with cruise control, and Bluetooth connectivity, but it’s the EX model that offers the best value for money with features such as an 8-speaker audio system. Available on all but the Sport model, safety features include lane keeping assist and adaptive cruise control with low speed following. The Civic hatch was awarded as an IIHS Top Safety Pick for 2017. The Honda Civic hatch has taken a quantum leap forward in the compact hatchback segment. No longer second fiddle to the likes of Volkswagen, the Civic is feature packed, with plenty available performance and exceptional handling abilities. This is quite easily one of the best complete packages money can buy.